During high season, when tickets from Cusco are not available at last moment, tickets from Ollantaytambo may still be available.. It was really very very scenic. Cusco to Machu Picchu by Vistadome was really a memorable experience. Peru rail which is owned by a private company named Orient-Express offers several routes of journey and it is also the only method of travel to Machu Picchu if you don't want to walk Inca trail. The most popular train routes connect Cusco, the Sacred Valley and Machu Picchu. Another Popular route of travel is the Titicaca route from Cusco to Puno. 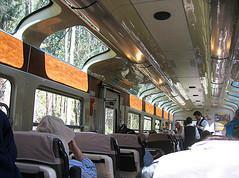 Peru rail also offers a charter service on the route from Cusco to Arequipa. But there is no regular train between Cusco and Arequipa. Also Lima is not connected to any city by train. Many people try to find out out the train between Lima and Cusco. I just want to let you know, there is no train between Lima and Cusco. Peru rail operates several classes of trains between Cusco to Machu Picchu for the 3-hour to 25-minute trip. All trains traveling to Machu Picchu from Cusco stops at Ollantaytambo. There have three different train service from Cusco to Machu Picchu on the basis of what service is provided on those trains. I listed those in the table below. Less Expensive Vistadome has windows at both sides in and roof also. Cheapest Cheapest, but service is good. Hiram Bingham: Departing from Poroy station (20 minute taxi ride from Cusco) Hiram Bingham starts it's magical journey in a much leisurely way than the traditional train journeys. 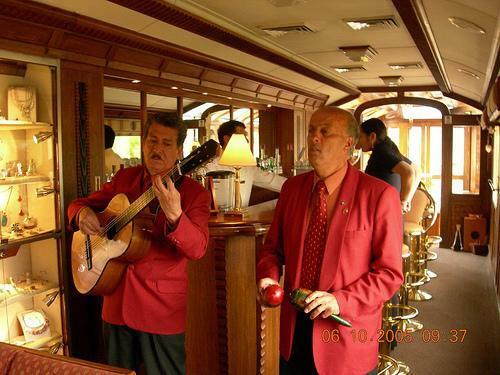 This train is the most luxurious way to travel from Cusco to Machu Picchu. It is named after the explorer who discovered the valuable remains of Inca civilization on July 23rd,1911.The train can carry up to 84 passengers and it consists of two dining cars, an observation bar car and a kitchen car. In the morning route from Cusco to Machu Picchu brunch is served as you enjoy the scenic beauty of lush green landscape and after reaching your destination and exploring the the marvel of Machu Picchu cocktails and a gourmet dinner are served on the way of return from your destination. Vistadome: This train runs fast and it also offer a first class train service. Starting from Poroy station at early in the morning the train continues it's journey through green fields and colorful villages on the foothills of Andes. Then the train descends into the sacred valley, crosses the Urubamba river and reaches Machu Picchu, the lost city of Inca. The train service offer snacks and soft drinks. The most fascinating thing about this train is that it has rooftop windows other than spacious windows on both sides of the train to enjoy the scenic beauty of nature. Backpacker: This train is the slowest and cheapest one. 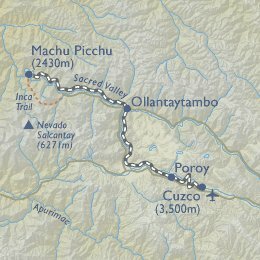 The journey begins from the village of Poroy just out side Cusco and before reaching Machu Picchu travels along the river Urubamba, with inspiring views of the canyon.The Backpacker train service serves snacks or drinks at an additional cost. For timetable and Fare of the three train services look at my page on Machu Picchu train. From Sacred Valley (Ollantaytambo) to Machu Picchu: This train travels from the famous Sacred Valley of Incas to Machu Picchu. To travel in this route you can choose either Vistadome Valley or Backpack Cerrojo train service. The journey begins from Ollantaytambo, the heart of the Sacred Valley and continues traveling to and from the Machu Picchu. From Ollantaytambo you can reach Machu Picchu by train. Take a taxi from Cusco to reach Ollantaytambo. Another alternative is taking a local bus from Cusco to Urubamba, then from Urubamba take another local bus to reach Ollantaytambo. This way you need to spend extra one hour or so to reach Ollantaytambo. But that is not a waste of time considering Ollantaytambo is also a popular tourist spot. You can spend some time on the ruins here before finally you start your train joinery to Machu Picchu. Though this page is on Trains in Peru, but I want add some more information on how you can save some money on this route with a combination of bus or taxi and train in between Cusco and Ollantaytambo. The distance between Cusco and Ollantaytambo is 65 km (40 miles), and you need to pay $25.00 if you travel by taxi,	only 2/3 $, if you travel by bus. Make sure when you buy a ticket from Ollantaytambo, you buy it round trip. Otherwise you have to wake up too early next day in Machu Picchu just to buy the ticket from Machu Picchu to Ollantaytambo. Tickets are selling fast there. Why you should take train from Ollantaytambo! Don't take the direct train from Cusco, reach first Ollantaytambo, then take the train from there. It will be cheap and easy. Read more on my	Machu Picchu train page. 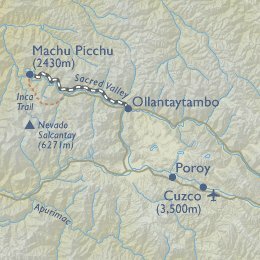 There is only one train service, Andean Explorer, in this route. 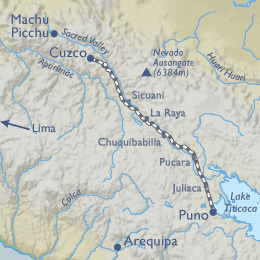 The Andean explorer runs between Cusco and Puno. People who are interested to go to Lake Titicaca or Puno usually like to use this service. The train starts from Wanchaq station at Cusco. It is a luxurious 10 hour train ride which includes full lunch service and most importantly a large window. As the train travels it continues it's journey to Higher and colder altitudes. In the first half of the journey you can enjoy the magnificent sceneries of Andean mountains and in the second half of the journey it reaches the Andean rolling plains where vicuña and alpaca can be seen. 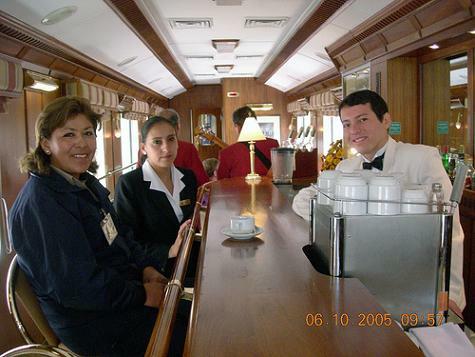 The Passengers are served a three course lunch in their dining car, followed by coffee in the observation Bar- car. A part of the observation deck is open, ideal for photography. Lunch and afternoon tea are included in the train ticket and restaurant and bar services are also available at an additional cost. During the ten hour train ride not only natural sceneries change but also climate alters so passengers should be ready for these changes. After almost 4 hours of the journey the train arrives at La Raya a picturesque stop at 4321m(about 14,200ft) and it stops there for 10-15 minutes. The train carries oxygen supplies for the people who get altitude sickness. Sometimes people feel dizziness, nausea, trouble breathing as they travel from Cusco(3300m) to Puno(3900m). Shortly after leaving La Raya lunch will be served. For the main dish you can choose from chicken, Tuna or Vegetarian whichever dish you like. At tea time (around 5pm) tea or coffee is served with snacks. During the second half of the journey the landscape will change from mountains to flatter lands and farms will change from crops to animal farms. Herds of llamas, alpacas and sheep are seen. The train has to make some unscheduled stops here and there if there is something on the tracks. The train schedule and price is as given below. Andean Explorer doesn't run each day of a week. Here are some more information on days it travels.